Leslie is a valued member of the Goin' to Grandma's team and also operates OH K-9 Training here in Hereford. She is a graduate of the Animal Behavior College where she earned certification as an ABC Certified Dog Trainer. Animal Behavior College (ABC) is approved by the Bureau for Private Postsecondary and Vocational Education and is an internationally recognized school. Commitment to this program has provided Leslie with a formal education in canine obedience training and understanding canine behavior. 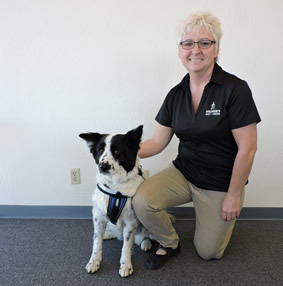 Her certification, education and experience provide Leslie with the skills required to effectively and humanely train your dog while keeping alive the spark that makes your dog so special to you. 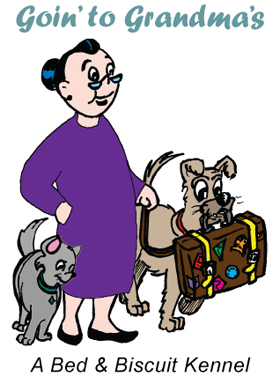 It is her goal to keep every dog in its home and to keep every owner happy with his or her dog. Leslie is a dog lover first and a trainer second. She knows from first-hand experience what a difference training can make in the relationship between dog and owner. Her dog Kona was a 3-time shelter returnee when she went to Leslie for foster care. She worked with her on socialization and trust, then on obedience. Kona ended up staying permanently with Leslie as the two fell in love and Leslie couldn't bear to send her off to someone else. Kona has earned her AKC Canine Good Citizen certificate and is now trained as Leslie's service dog assistant. Leslie feels it is never too early to begin training your puppy and never too late to begin training your dog. With an investment in training, a wonderful transformation will occur for both dog and owner. She has been working with dogs and their owners for many years and nothing satisfies her more than seeing a happy dog and happy owner!